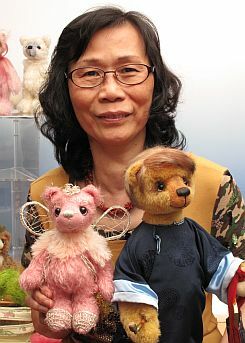 HKTBA Founder, Bear Making Teacher and Bear Artist . . .
Gloria's book has been published. 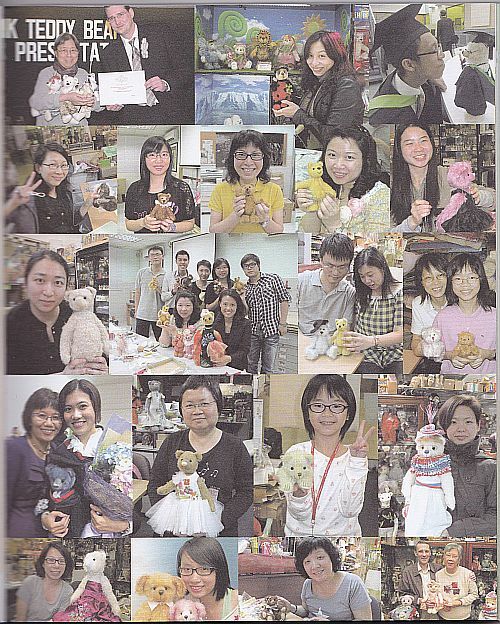 Gloria Chan, Gloria's Handicraft Studio in Honk Kong, new book is filled with stories about her childhood, youth and how she advanced to being the director of the Hong Kong Teddy Bear Association, a gifted teddy bear artist and bear making teacher. Since the publishing company has no idea, at the moment, how to translate from Chinese to English, we'll give you a brief over view. Gloria begins, "The first of the book to page 22, is my story. You will be surprised that I am not the kind of person you supposed I was. That's not to interesting because of all the hard work I had to do. The publishers kept it all because they thought my life stories were remarkable." 186 pages, loaded with colorful photographs and written in Chinese. (Page 65) The book is filled with Gloria's memories including a story about a young man who came into her shop wishing to buy a gift for his girl friend. "He asked me to write "Love you forever" on the gift." Gloria looked at that man and said, "maybe you should think more carefully." The man responded "she is a very beautiful girl. I like her very much, but the girl seems did not have the same mind as me." Gloria asked "How old are you" - 23 years old. "How old is that girl? "- Also 23 years old. "What 's the age you wish to marry?" - About 30 years old. "When the time you marry, what age do you wish your bride to be?" The young man hesitated a while then said, "not more than 25." (Page 74) "Is the story about a man with seven gold mines. He was one of my customers. That was a sad story, even a man had great wealth, he was not happy." Gloria has future plans to write about book about couture for teddy bears, to tell the details about how to make a professional costume. 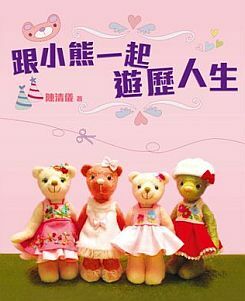 "I wish to make the couture bear book in two version, Chinese and English. 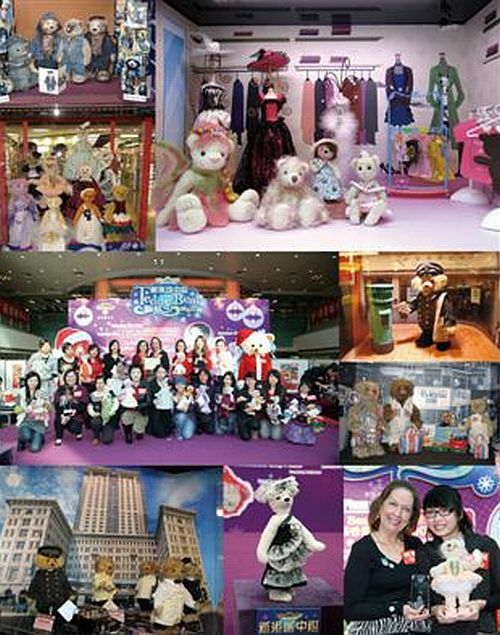 If this new book sells well then the couture bear book could possibly be published." Gloria has traveled to many cities around the world, meeting artists, show promoters, taking classes and greeting collectors. 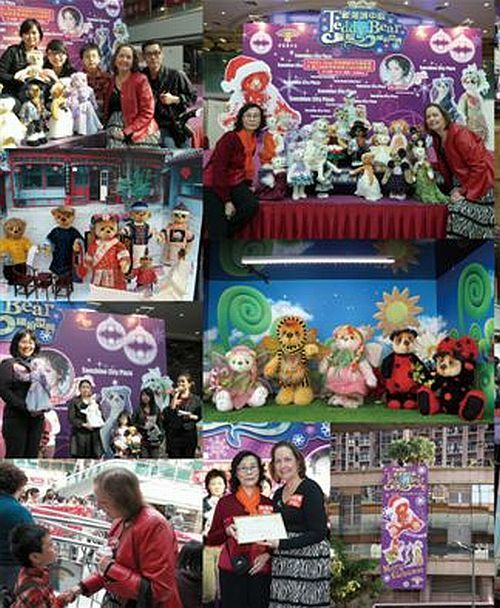 Editors note: It was my pleasure to travel to China, meet Gloria, the bear making and award winning students and to participate in the Hong Kong Teddy Bear Awards Ceremony. See . . .
For a copy of Gloria's book, please eMail her for the details.